Nearest: Tube & Railway Station: London Paddington 158 yards (144 metres), Motorway: M1 Junction 1 4.5 miles (7.2 km). 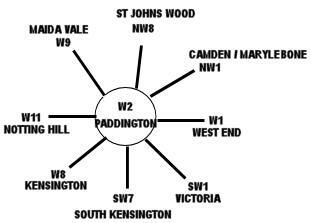 Within a 0.5 miles (0.8 km) circle of the hotel are 5 tube stations (underground system). The Mercure London Paddington Hotel is situated in the central London location (slightly to the North West of centre) of Paddington. This is a very popular area for a budget stay while having good access to all of London via the excellent transport links. Less than 200 yards from Paddington Station from where you can use the Heathrow Express and Connect services for Heathrow Airport. Within walking distance is Hyde Park while shopping and other amenities can be found nearby at Queensway, Notting Hill, Edgware Road and Marble Arch. Also closely is the Portobello antiques market on Ladbroke Grove. Nearest attractions include Madame Tussauds, Kensington Palace, the Wallace Collection, Alexandra Fleming Museum and the Royal Albert Hall. The Mercure London Paddington Hotel offers its guests contemporary style accommodation on the doorstep of one of London's largest mainline and tube stations. Bedrooms have a modern look and feel. All rooms are en-suite with an oversize shower, bath, hairdryer and toiletries are supplied. Bedroom amenities include air conditioning, trouser press, iron, coffee maker, safe, high-speed Internet access (wired and wireless), direct dial telephone with voicemail, trouser press, minibar, in-room safe and fully interactive flat-screen TV with pay movies, onscreen bill view and satellite channels. There is a room service menu (0.800 till 22.000) of hot and cold dishes and and includes breakfast options. All floors are accessed by a lift. The hotel restaurant (actually located adjacent to the hotel) is the air-conditioned Garfunkel's Restaurant which is open from 07.00 till 22.30. On the Ground Floor is the Gallery Lounge bar with its 42 inch plasma television and Sky Sports channel along with the restaurant and reception. The Mercure London Paddington Hotel offers business amenities which include 2 meeting rooms for up to 20 guests. For the energetic there's the free onsite fitness centre which is open 24 hours while for a more relaxing time spend time in the hotels basement located executive lounge with its large screen TV. WiFi is available in public areas, meeting rooms and bedrooms. Luggage storage facilities are available on request. Same day laundry and dry cleaning. Reception is staffed round the clock, 24/7. Mercure London Hyde Park: is 163 yards (149 metres) away, has a guest satisfaction score of 79% and rates start from about £118. Mercure London Kensington: is 1.6 miles (2.6 km) from here, earns a customer rating of 72% and base rates begin at about £80. Mercure London Bloomsbury: 2.2 miles (3.6 km), rated at 81% and with rates from around £106. Mercure London Bridge: 3.3 miles (5.4 km), rated at 83% and with rates from around £99. Compared to other London hotels: This hotel has been rated 73% by past guests. The London average is 80% and the average for 4 star hotels is 83%. Therefore this hotel is below average for its sector (star rating) . Mercure Hotels across the chain average 74% so this hotel is slightly below the guest rating for most Mercure hotels. Milesfaster ranking: 685th from 866 London hotels, 4th of 7 Mercure Hotels, and 297th of 328 four star rated hotels. Another to Consider: A similar type of hotel (size, rating) nearby (0.1 miles, 0.1 km) would be the 4 star Hotel Indigo London Paddington, with rates that start from about £136 and which has an 89% guest satisfaction rating. The Hotel Indigo London Paddington also offers: free WiFi. We can also suggest a cheaper options nearby which would be the Park Grand London Hyde Park. 0.2 miles from here (0.4 km), has scored 78% from former guests and has rates from around £78 (theres free WiFi too). Something close by with a great client rating? We suggest the 5 Star The Arch Hotel may well be of interest to you, it's only 0.6 miles (1.0 km) from here. The Arch Hotel has an extremely high guest rating of 98%, one of the best rated London hotels. The fifty closest hotels from here (144 Praed Street, W2 postcode) that we have data for cover a 0.5 miles (0.8 km) radius. The 50 consist of 1 five star hotel (rated 89%), 20 four star hotels (average rating 80%), 18 three star hotels (average rating 71%), 10 two star hotels (average rating 66%) and 1 one star hotel (rated 62%). Of these hotels the highest rated is Royal Park Hotel (4 star) at 90%. Base Rates: See how the area stacks up for low rates using base rates. We use published base rates but note these do not reflect special offers or short term discounts so remain a rough guide. We have calculated the average base rate for all the 50 nearby hotels at £103 per night. The low end of the scale shows rates from £11 at Smart Hyde Park View Hostel (2 Star, 71%) to a high of £720 at Commodore Hotel (4 Star, 60%). Rate averages for each star rating: Five Star average: £269, Four Star average: £151, Three Star average: £76, Two Star average: £45 and One Star average: £49. We rank hotels based on their guest rating but balanced for their influencing factors and we rank Mercure London Paddington Hotel 27th (joint) of 50 nearby hotels and 17th (joint) for the 20 four star hotels in the area. Compared to the nearest alternative hotels this hotel is 37th of 50 (8th of 20 four star hotels.) for base rates. Balancing the hotels rates and user rating we rank the hotel 41st of 45 when judging the balance of price point to user rating (Smart Hyde Park View Hostel was top).